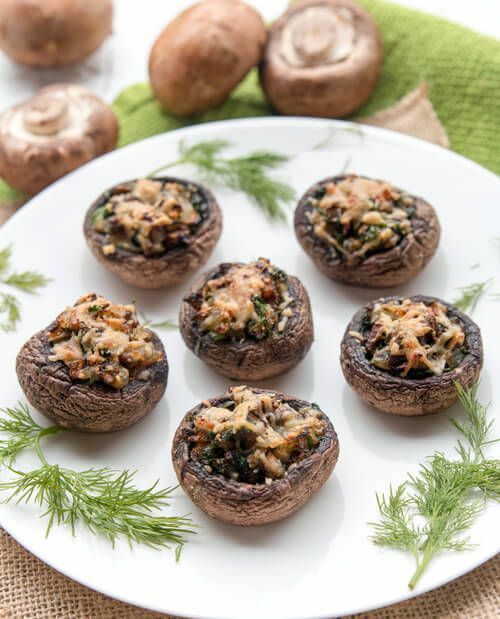 These herb stuffed mushrooms make the perfect and healthy start to your holiday party. It's a very low cholesterol food, and packed with protein, vitamin C, zinc, iron and manganese. Mushrooms are also a great source for vitamin D, which could be hard to get during the winter season. Vitamin D is the sunshine vitamin. It is essential for the support of healthy bones, teeth, immune system, brain and even nervous system. Vitamin C helps cure the common cold which is something everyone needs this winter season! The parsley and onion contain a good amount of vitamin C. Another great health benefit this recipe contains is that can prevent strokes! The olive oil has been proven to be a great source of monounsaturated fat which links to preventing strokes. Take the stems off the mushrooms and chop them up. In a skillet, heat up 1 tablespoon olive oil. Add chopped onion and saute for 1 minute. Add in chopped mushroom stems and 1 minced garlic to the onion. Stirring often, saute for another minute. Mix into mushrooms the stems of parsley, dill, and 3 tablespoons grated parmesan cheese. Stuff mix into mushroom heads. Sprinkle remaining (1 tablespoon) grated parmesan cheese.